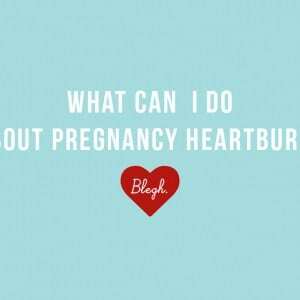 Your baby is just starting to use her taste buds, so why not really wow her? Herbs and spices are important and easy to add to your child’s dishes, and they provide several health benefits you just won’t find anywhere else. 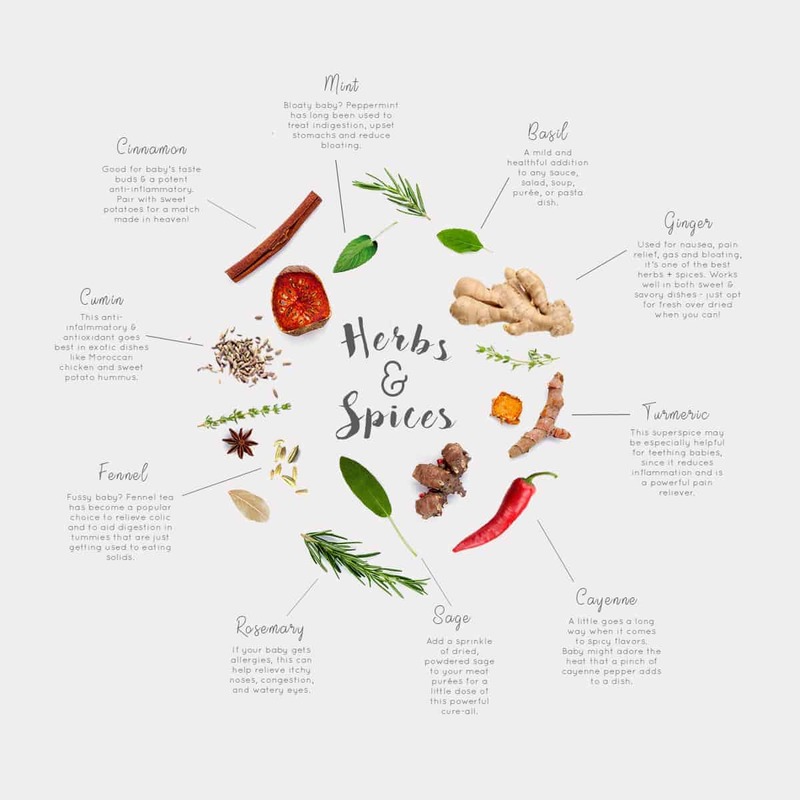 These top 10 herbs and spices will add flavor (and nutrition) to every bite. Fussy baby? Fennel tea has become a popular choice to relieve colic and to aid digestion in tummies that are just getting used to eating solids. The tea can fill your baby up without adding many nutrients, so we prefer adding fennel to recipes like tomato and fennel soup. Mint can brighten up any dish; we use it to jazz up our pear and apple yogurt purée. Peppermint in particular is a good source of vitamins C and A, and it’s long been used to treat indigestion and upset stomachs. It can also reduce bloating, which will ease those uncomfortable gas pains. A staple in Middle Eastern dishes, cumin has a surprising number of health benefits. It’s a powerful anti-inflammatory and an antioxidant. Cumin actually fights diabetes and can decrease blood sugar and cholesterol. Try it in exotic dishes like Moroccan chicken and sweet potato hummus. 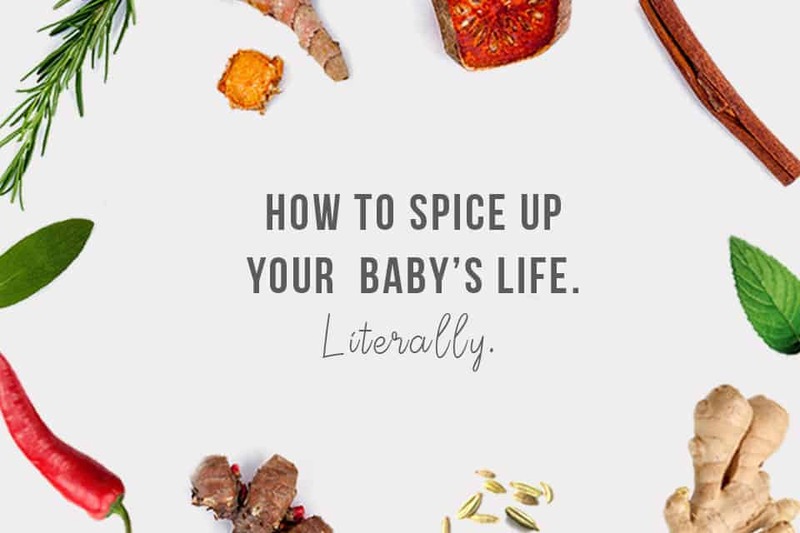 Remember, a little goes a long way when it comes to spicy flavors, but your baby might adore the heat that a pinch of cayenne pepper adds to a dish. The capsaicin in cayenne pepper offers tons of health benefits, including improved circulation and hearth health. It even has cancer-fighting properties! Basil is a mild and healthful addition to any sauce, salad, soup, purée, or pasta dish. This green leafy herb comes in several varieties; all have many nutritional benefits, but research has found that holy basil in particular can inhibit the growth of bacteria like staphylococcus. It also helps control blood sugar and boosts the immune system. Even babies get allergies, and rosemary can help. This tasty, flavorful herb is rich in rosmarinic acid, which can relieve allergy symptoms like itchy noses, congestion, and watery eyes. Rosemary can also reduce the formation of cancer-causing HCAs, which are created when meat cooks at high temperatures. Sage has a warm flavor that enhances pork, sausage, and other meats. 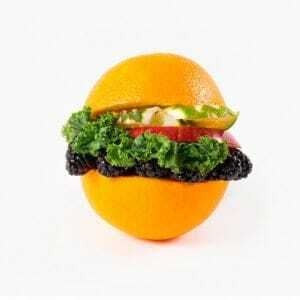 It’s been used as a traditional medicine in almost every health problem you can think of: obesity, diabetes, depression, dementia, lupus, cancer, heart disease – even autism! Add a sprinkle of dried, powdered sage to your meat purées for a little dose of this powerful cure-all. Anti-inflammatory. Anti-bacterial. Antioxidant. What can’t turmeric do? This superspice may be especially helpful for teething babies, since it reduces inflammation and is a powerful pain reliever. Try turmeric in this tzatziki recipe for an all-around healthy meal that’s perfect for summertime. If your baby has been gobbling down sweet potatoes, add a sprinkle of cinnamon – these two are a match made in heaven! This delicious spice is often paired with sugary baked goods, and we totally get why. It isn’t just good for your baby’s taste buds; the cinnamaldehyde in cinnamon is a potent antioxidant and anti-inflammatory, and it lowers blood sugar and cholesterol. Ginger makes an appearance on every list of the best herbs and spices, and it’s easy to see why. It’s used for nausea, pain relief, gas and bloating, and as an anti-inflammatory and antioxidant. Ginger works well in both sweet and savory dishes. Fresh ginger has the most gingerol (the compound that gives it such great benefits), so opt for fresh over dried if you can. Remember, it can take several tries for a baby to accept a new food, but the more you diversify her palate now, the less likely she is to become a picky eater later!